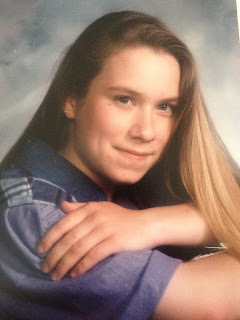 These are the products that I picked for this linky. 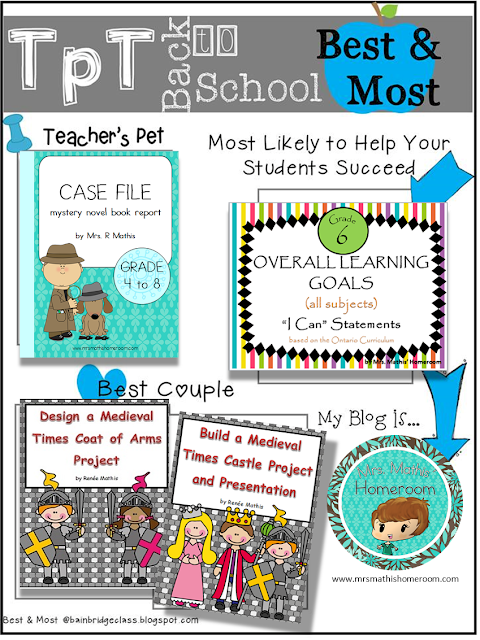 My Mystery Novel Book Report Case File Project gets the Teacher's Pet award because it's my absolute favourite product. I worked really hard on this one while I had a long term contract and was really looking forward to use it with "my" little class, but the teacher returned sooner than expected and I didn't get a chance to finish it with "my" students. 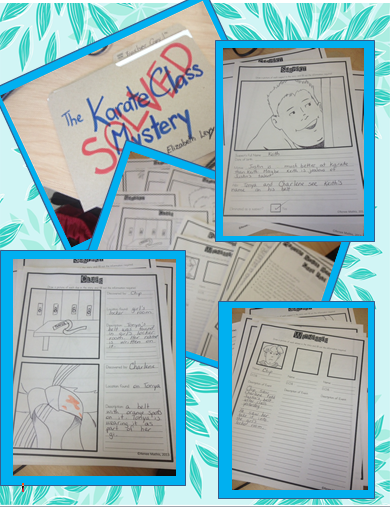 Students create a case file for a mystery novel of their choice. They start with a blank file folder and write the title of the book on the cover. Once the project is over, they write "Case Closed" or "Solved" over the book title. Inside their file folder, students insert a small bag with "evidence" found in the story. This is where they can get creative and collect things from around the house, or the classroom, that could have been evidence in the novel they read. They also insert case notes (chapter summaries), lists of victims, suspects, witnesses, weapons, clues and red herrings involved with the case. The solution to the mystery is written on an index card and sealed inside an envelope marked "Mystery Solved". Here is a preview of what that project looks like. How fun would that be as a book report?! 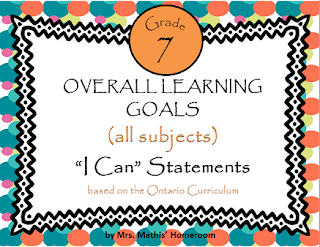 For the Most Likely to Help Your Students award, I picked my Learning Goals "I Can" Statements based on the Ontario curriculum (Grade 4, Grade 5, Grade 6, Grade 7 and Grade 8). We know there are big benefits to a student's education program when appropriate goals are set in place. 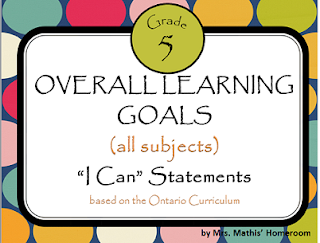 Students feel more ownership and accountability towards the goals. 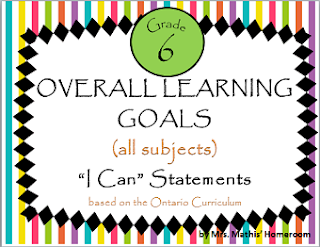 Since the curriculum document is overwhelming to parents and students (and to most of us at some point or another), I have written the overall expectations from the Ontario curriculum in student friendly language. The OCD side of me also colour-coded the posters according to the colour assigned to each curriculum document. 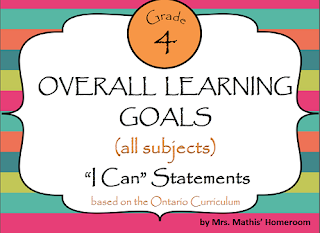 :) Teachers can now post each day's learning goals for students, parents, and administrators to see and as a visual reminder of the commitment we make in our students' education. Finally, for the Best Couple award (the award that yours truly received in high school, much to my father's embarrassment! 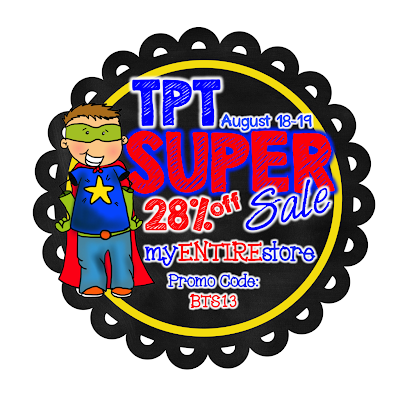 ), I picked my Design a Medieval Times Coat of Arms Project and my Build a Medieval Times Castle Project. During my contract in grade 3 and 4 a couple of years ago, I got to teach all about the Medieval Times. It was such a fun unit and students were highly engaged. These are two projects that we did together. Kids had a blast with them. 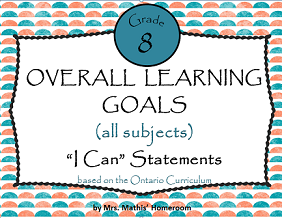 You can read about these projects ( and see some pictures of students' work) by clicking here. 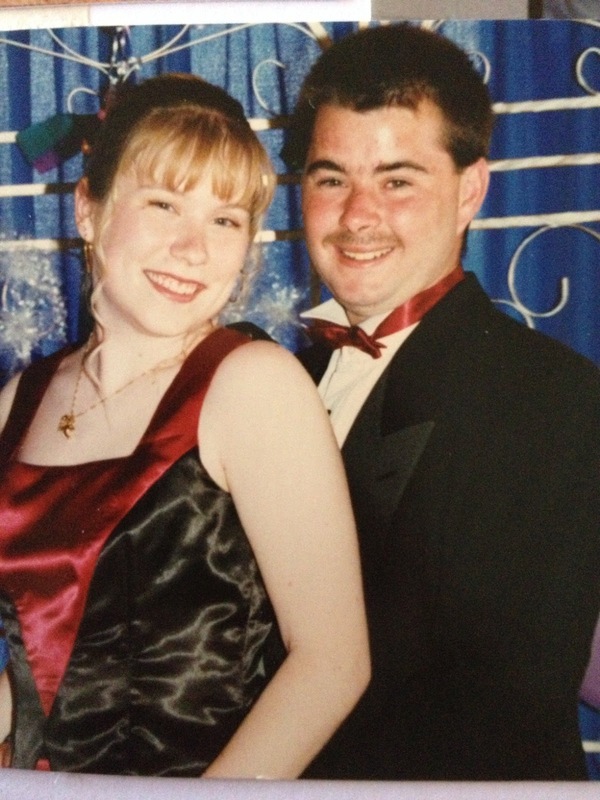 Were YOU nominated for any "awards" in high school?